Seasonal room escape games can be tricky in that they are designed to be enjoyed only around certain times of the year. The way to get around that is to either make the puzzles so fantastic that the player doesn't mind when they are playing, or set the game in a decidedly non-seasonal setting. Isn't it nice that we have Tesshi-e to do both with their new room escape, Santa in the Southern Islands? Santa in the Southern Islands should really be named Santa in the South Seas, because it looks like the jolly old man has decided to take a tropical vacation before dealing with his once-a-year deadline. And the deadline is fast approaching, so it's time to go back to the cold and the snow and the...wait, did the elves just lock him into his vacation cabin? Yes, indeed, and now Santa must solve his way out or Christmas might not make it on time. Looks like it's really, really hard to get good help these days. Featuring some familiar things (it just wouldn't be Tesshi-e without Mr. Birdy and a wobbly picture puzzle, would it?) and some new, Tesshi-e is in fine form with a host of amusing and challenging puzzles dealing with logic, math, color, and a little intuition. They have also continued their latest tradition, having colors show up in text when the cursor is hovered, making the game accessible to everyone. As usual the game comes in English and Japanese, and of course there's a happy coin escape is well. With its lush tropical backgrounds (time for a beach vacation! 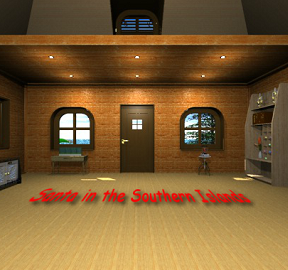 ), zippy music, and thought-provoking puzzles, Santa in the Southern Islands is a welcome room escape any time of the year. Take a break to enjoy Tesshi-e's very unseasonal Christmas present to all room escape fans! Santa in the Southern Islands Walkthrough now available! For the colorblind: hover your cursor over an object, if the color is important you will see text. Don't forget to examine everything you pick up, objects may be hiding things. Be careful with the paint. There are two endings, regular and happy coin. You begin by facing the doorway out. There are windows and small tables on either side of the door. Above you can see an attic loft, but there is no way to reach it. Click on the small table to the right of the door for a close up. There is a machine here with a lever, three buttons, and a red Santa under glass. Back up, then click on the window above the Santa machine for a close up. Outside you can see a dock and a sign, but the sign is too far away to read. Back up. Now click on the table to the left of the door. This is a slightly larger table. There is a device here with four alcoves. The table also has a drawer. Click on the drawer to open it. Inside the drawer is a red stencil, take it and back up. You are now facing a long, low cabinet with three sets of doors. Above the cabinet are two windows. To the left of the cabinet are some couches, two pictures on the wall, and an oar attached to the wall. Click on the cabinet for a close up. You can now see the cabinet in more detail. On the right is a golden device, on the left is a machine with three Mr. Birdy figurines. Click on the gold device for a close up. The device has buttons with letters on them, they spell out S-T-A-M-E-N. Back up. Click on the Mr. Birdy device for a close up. This device also has a lever and a button, but they don't seem to work. Look closely at the front of the device, there is a large area that looks like it would open up. There is a much smaller blue area below that, click on it for a close up. Click on the blue area again, looks like a battery compartment. Now we just need a battery! Back up twice. Click on the right set of doors for a close up. The doors have a three digit code lock, and below the doors it says "Balls" and has three groups of numbers, 235, 1236, and 134. Back up, then click on the center set of doors for a close up. This set of doors needs a key. Back up and click on the left set of doors for a close up. Click on the doors to open them. Inside you will find a white Santa figurine. Take the Santa and back up three times. Click on one of the windows above the cabinet twice for a close up. There is an object out on the water, but again it is too far away to really see. Back up twice. Click on the sofas to the left for a close up. There is a small object on the right sofa, click on it to take it (battery). Between the sofas is a glass table with a small white object, click on the object for a close up. The object looks like an egg, but is not easily breakable. Back up. Click on the oar on the wall twice for a close up. Looks like you need a wrench to get the oar. Back up twice. Click on the smaller blue painting to the right for a close up. Yep, it's the wobbly picture puzzle. Back up. Click on the larger painting on the left for a close up. This looks like a picture of a plant. On the top of the plant is a wooden Mr. Hippo. You are now facing a wall with two windows. There is a ship's wheel mounted on the wall between the windows, click on it for a close up. The wheel has the words "Santa team". Apparently Santa has a rowing team. Back up and turn left. You are now facing a wall with two windows. There is a ladder attached to the wall below the windows. To the left of the windows is a tall bookshelf. Click on the ladder for a close up. Looks like we need a key to unlock it. Back up. Click on the left window for a close up. Cool, the way home is a hot air balloon! Back up. Click on the bookshelf for a close up. On an upper shelf there are some brown books, click on them for a close up. The books are numbered I through VII in Roman Numerals. They also have the zodiac symbols for Cancer, Leo, Virgo, Libra, Leo, Virgo, and Libra on them. Back up. Below the books is a smaller set of shelves. This forms a 3 x 5 grid. Each cubby in the grid has a different number of colored balls. We're back where we started, at the door. Time to solve some puzzles! Turn left to face the low cabinet. Click on the cabinet for a close up, then click on the Mr. Birdy machine for a close up. Click on the battery compartment for a close up, open the compartment and place the battery. Back up once. Flip the lever to the down position, then push the button. The doors in front of the machine open up to reveal some blue paint and a brush. Take the paint. Flip the lever to the up position, then push the button. This time the Mr. Birdy figurines start flapping their wings. It must be a clue! Click on the cabinet for a close up, then click on the gold figurine on the right for a close up. We just need to figure out what buttons to push in what order. The clue is on the ship's wheel, the one that says "Santa team". Note that all of those letters show up in the word "Stamen". Click on the buttons to spell Santa team. The figure will open up, revealing a screwdriver. Take the screwdriver. While it is in close up, notice that you can click on it to change it from a flat head to a Phillip's head and back again. Close down the screwdriver and back up twice. Note: You can change the screwdriver to a flat head, then use it to open the blue paint in your inventory. Let's get the red Santa out of that machine to the right of the door. Turn right to face the door out. Click on the small round table to the right of the door for a close up. Now we just need to push the buttons in the right order. The clue was in the motions of the Mr. Birdy figures. They moved: left once, right once, middle twice, right once, middle once. This is the pattern for the buttons: left, right, middle, middle, right, middle. Flip the lever into the up position, then push the buttons in the proper order and the machine will open up. Take the red Santa. While the Santa is in close up, click on it to turn it around. There's something hidden in the back! Click on the back of the red Santa to get the spade key. Close down the key and back up. Click on the right doors twice for a close up. That clue that says "Balls" and has the numbers must be a clue to the three digit code. Have we seen balls in the room? Yes, in that 3 x 5 cubby in the bookshelf. Each cubby has a different number of balls. Look at the number clusters. For 235, fill in each cubby that has 2, 3, or 5 balls. You will see the number 4 form. For 1236 fill in each cubby that has 1 ball, 2 balls, 3 balls, or 6 balls. This will form the number 6. For 134, fill in each cubby that has 1 ball, 3 balls, and 4 balls. This forms the number 1. Therefore the clue is 461. Enter the number into the three digit lock. Click on the doors to open them. Inside you will find a blue Santa, take it. Turn left or right twice to face the wall with the ladder. Click on the ladder for a close up. Use the spade key to remove the ladder. It will automatically set up to the loft when you take it. Turn left to face the door. Click on the top of the ladder to go up to the loft. You will see a box on the floor, and a hammer. Take the hammer. Click on the box for a close up. Looks like we need a four digit code here. Click on the window for a close up. The window is screwed shut. Guess we need a screwdriver. Good thing we have one! Pull up the screwdriver and change it to the Phillip's head. Use the screwdriver on the window shutters to open them. The window has four quarters, and each quarter has a zodiac symbol. Back up twice to the main room. Click on the furniture grouping to the left. Click on the egg on the table for a close up. Use the hammer on the egg. This reveals a club key, take it. Click on the low cabinet for a close up, then click on the middle doors for a close up. Use the club key to unlock the doors and take the binoculars. Yay! Click on the blue picture on the wall to the left of the low cabinet twice for a close up. It's time to solve the wobbly picture puzzle. Where have we seen the clues? The clues are in two places: the brown books on the bookshelf, and the window in the loft. Remember, the books were numbered in Roman numerals, and each also had a zodiac symbol on it. The window in the loft was divided into four quarters, each with a zodiac symbol. So the clue would be the numbers applied to the zodiac symbols. The upper right of the window had the symbol for Leo, which was on books 2 and 5. The upper left of the window had the symbol for Virgo, which was on books 3 and 6. The lower left of the window had the symbol for Libra, which was on books 4 and 7. The lower right of the window had the symbol for Cancer, which was on book 1. Therefore the pattern is: lower right, upper right, upper left, lower left, upper right, upper left, lower left. Click on the picture corners in the correct order to move the picture. Inside you will find a yellow Santa. Take the Santa and back up twice. Click on one of the windows over the low cabinet twice for a close up. There's that object way out in the distance on the water. Use the binoculars on the object to see a Mr. Hippo with four colored Santas, green, red, blue, and yellow. Back up three times and turn right. Click on either of the windows beside the door for a close up. Use the binoculars on the distant sign and you can read a clue: 5171. Back up twice and turn right. Click on the window to the left of the rocking chair for a close up. Use the binoculars on the hot air balloon. Okay, the elves are just asking for it now. Back up twice. Turn left to face the door. Click on the top of the ladder to go to the loft. Click on the box on the loft floor for a close up. Use the code from the sign outside (5171) and click on the top of the box to open it. Inside the box is a can of water and a rag. Take the water and back up three times. Okay, now we have four Santas, and we still have that strange device with four empty cubbies to the left of the door. Perhaps the colored Santas we saw through the binoculars are a clue, they were green, red, blue, and yellow. The problem is that we have a blue, red, yellow, and white Santa. What would happen if we painted the yellow Santa blue, would it turn green? You can do so by pulling up the Santa in your inventory, then using the blue paint on it (the paint needs to be open). No, it just turned blue. We could paint the white Santa blue. Okay, now we have three blue Santas and a red one, that's no good. Pull up each blue Santa, then use the water/rag combination on each one. Hey, the white and yellow Santas are back to their original color, but the blue Santa is now green! Pull up the white Santa and paint it blue. Now you should have a green, a blue, a yellow, and a red Santa. Click on the table to the left of the door for a close up. Now place the Santas in the order you saw on the Mr. Hippo: green, red, blue, and yellow. A heart shaped key will come out of the slot, take it. Use the heart key to open the door. Well, we can get out now. Go forward out the door. There is a deck in front leading to the sign. There is also a potted plant to the left. Go forward to the sign. Turn right and you can see the balloon. Go forward to the balloon. Great, we need another key? Turn right, then go forward to the sign. At the sign turn left, then go forward to the house. Okay, there's a mailbox here. Click on it for a close up. And we need another four digit code. Back up. Turn right. You can see that Mr. Hippo in the distance. Turn right to face the sign. Go forward to the sign, then click on the sign for a close up. You know what we haven't used yet? The stencil. Place the stencil on the sign. Use the blue paint on the stencil. Remove the stencil and you have a new number clue, 6394. Back up, turn right (or left) twice to face the house, then go forward. Click on the mailbox for a close up, then enter the four digit number. Click on the mail slot above the four digit code to open the box. Take the wrench from inside and back up. Click on the door for a close up, click to open it, then go back inside the house. Turn right to face the low cabinet. Click on the oar on the wall three times for a close up, then use the wrench on the bolt. Take the oar, back up three times, then turn right. Go back out the door to the deck. Click on the potted plant to see the canoe. Click on the canoe to get in. Click on the front of the canoe to push off from the dock. Now you have a choice of going right or left. The clue is in the picture of the plant inside, the one with the Mr. Hippo on top. Starting at the bottom, you want to go in a direction until you hit an intersection, then go in the direction that will eventually lead to the hippo. That order is left, right, right, left, left, right. Turn left and right according to the plant clue and you will see the Mr. Hippo. Click on the Mr. Hippo for a close up. Note the small ball behind the blue Santa, click on it to take it. Back up to go back to the house. Click on the stairs to go up to the deck. Pull up the ball from your inventory and click on it to open it. You now have a triangle key! Turn right (or left) twice to face the sign. Go forward to the sign, then right, then forward to the balloon. Use the triangle key to open the locked gate. Once the lock is gone click on the gate to open it. Click on the balloon to escape! And enjoy the relaxing coffee! Follow the regular escape to the point where you open the gate. Do not go forward! Instead, read the clue on the deck, which says "All blue". Turn right to face the sign and go forward. At the sign turn left and go forward to the house. Click on the door three times to go into the house, then turn left (or right) twice to face the door. Click on the table to the left of the door, the one where you placed the Santas. Take the Santas out of the machine one at a time, paint them blue, then place them back. In the slot you will now find the happy coin, take it and back up. Go out the door, forward to the sign, right, then forward to the balloon. Open the gate, then click on the balloon to escape. the elf in the hot-air balloon? I notice that the Japanese title actually translates as "South Sea Santa-san". The elf is just an elf, not a clue. The plate is used on something that you may not even have gotten a close look at yet if you don't have the binoculars. Out with the happy coin! That one was the perfect balance of adorable and logical. Also out with the happy coin! Either I'm getting better, or this one was relatively easy for Tesshi-e. I was stuck for a little bit before I found what to use the spade-shaped key on, but after that it flowed easily enough. the blue-painted Santa, the blue paint, the plastic mail plate, the screwdriver, and the red Santa. Use the paint on the white one. The ball clue is three sets of numbers that allow you to trace out numbers using the shelf of balls as a template. The shelf has a certain number of cells with a certain number of balls in each cell such that if the clue is, say, 134, and you fill in all the cells with 1, 3, or 4 balls, you end up with a line that could be a number "1". Did you try the ladder? Haha! Figured out the ball clue! three blue Santas, the blue paint, the mail stencil, and the screwdriver. I can't get the ladder because it keeps saying it's locked and the screwdriver doesn't work on it..
"Locked" as in "needs a key". How do I get green Santa? Also, can't remove the paddle from the wall, need a wrench, or something... Any help please? Do you have a Blue Santa, a White Santa, Blue Paint, and Water w/ Cloth? Clean the Blue Santa and paint the White Santa. Et voila. Sorry, Zanoushe, I got your inventory list and phd's mixed up. You may want to take a look at your Santas. How do you get to Mr. Hippo? All right! Got out with the Happy Coin! I still cannot figure out the diagram with the hippo and how to get to Mr. Hippo on the boat... Anyone can help? Please? There's a picture with a Hippo on a Tree. Its branches tell you when you should go left and right in the canoe to get to the hippo. If I can read my handwritten clues correctly, it looks like the answer was Left, Right, Right, Left, Left, Right. You have to open the gate before you can get the Happy Coin. No matter what you try, the Happy Coin won't appear until you've opened the gate to view the hint painted on the ground. I don't know why this one is rated so low, there's certainly nothing wrong with it. In fact, I really like some of the directions this takes. Tesshi-e goes outside? I DO think that it seems like the Christmas aspect was tacked on later, like it was "oh I didn't make a Christmas escape!" But it's forgivable, since it's not such a big deal in Japan, I don't believe. Still, it was a good one. Nice puzzles, nothing too hard, etc. Ho ho ho ! Now I have a machine gun ! ... I mean... a happy coin ! Tesshi-e should try and design us an escape from Nakatome Building ! I actually got out (with and without the Happy Coin) with a minimum of help! Also, is it just me, or do the regular and Happy Coin endings seem reversed? Like the one ought to have been the other? I agree with others that it seemed like the regular and Happy Coin endings were reversed, though. I think the endings were set up that way because the happy coin ending means you get to watch yourself go up. Have the ratings been spammed on this one ? They do seem relatively low for no apparent reason - I thought it was great, one of Teeshi-e's best for a little while in fact. But hey you have to have the happy coin !! what is drawer 3-digit code?